The iTelescope Planner makes finding thousands of beautiful objects in the night sky easy - customized for iTelescope observatories. It even takes moon phases into account, which is especially important around full moon. In order to use it with our telescopes, you need to be a member and can join here. We are proud to announce a new addition to our Siding Spring Observatory range of Telescopes - The new wide-field telescope T9. It is online now for our members! T9 produces exquisite images and will reward those that challenge it. The new iTelescope Launchpad is a completely revised panel with more relevant information on each observatory including roof open/close times, sun, moon and weather data. June represents the ultimate experience of the Southern Sky. The Milky Way is visible in its full glory from dusk to dawn, with long nights, albeit cold, yield to rewarding images under pristine night skies with excellent seeing. And long nights for taking superb images with iTelescope for hours on end. The images below are contributed by everyone in the Masterclass. Many thanks for the dedication! What can I image? - The Ultimate Planner is here! The iTelescope Planner makes finding objects in the night sky easy - customized for iTelescope observatories. It even takes moon phases into account, which is especially important around full moon. With the advent of the space satellite Gaia and the publication of a new database containing 1.7 billion stars, it may seem that the window for discovery for amateur astronomers is shrinking to zero. Not so! Josep Drudis, a passionate imager and affiliate of iTelescope, recently did something unorthodox when he was pointing his telescope at the reflection nebula IC 2220 in the constellation Carina, usually known as the Toby Jug Nebula. We are very excited to announce that iTelescope T12 is now back online, with wonderful improvements to the imaging system and guiding! iTelescope T12 has been one of the most popular wide field imaging systems on our network, but a few months ago, the SBIG STL-11000M CCD it had used for many years failed after a decade of constant use. or many of us, our first view of a narrowband image was the 1995 release of the “Pillars of Creation” from the Hubble Space Telescope (HST) (Fig. 1). 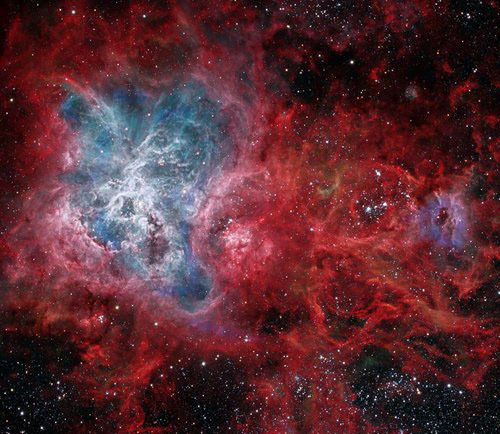 It was significantly different from the typical views of red emission nebulae, when RGB filters are used. Not only were the colors different, but there was remarkable color contrast and a 3-D effect unusual for traditional color images. This image was taken with emission line filters for ionized Hydrogen alpha (Ha), Sulfur II (SII), and Oxygen III (OIII). These three grayscale images were combined into an RGB color image using the now classic, wavelength-ordered (longest to shortest), HST palette, wherein SII is portrayed in red, Ha in green, and OIII in blue. iTelescope.Net Sky Tours held it's third live stream, titled The Black Eye and the Bright Eye, on the 15th of February, 2017 and we're happy to share it with you! In this episode, Dr. Christian Sasse took us on a wonderful tour of Black Eye galaxy and the Eight Burst Nebula, two unusual targets with amazing features! As with the second episode, you can download images taken during this stream simply by clicking this link. On February 13th, 2017, Episode 2 of iTelescope.Net Sky Tours was streamed live for all members. This was the second of our four free episodes of Sky Tours to introduce all members to Sky Tours and was titled Bright and Stunning Gems at Full Moon. During this episode, Dr. Christian Sasse took us on a tour of Omega Centauri and Eta Carina, taking wonderful images and answering questions live. We also added the newest feature of Sky Tours, the ability to download images taken during the Live Stream!. 20 publicly accessible telescopes across 4 observatories, located in both the Northern and Southern Hemispheres, that are fully controlled by you across the Internet. Ready to take the next step and participate? Become a member and join the community. iTelescope.Net is a not-for-profit organisation, and every dollar spent helps us grow and expand the network of telescopes. Large aperture telescopes to wide field systems, LRGB or Narrowband, we have you covered. Photometry, Exo-Planets, Comets, Asteroids, NEOs, Minor Planets, Supernova and Variable Stars. We even have a diffraction grating allowing basic spectroscopy. Premium private 1-on-1 private tutorials, conducted online, across the Internet. Astro imaging, ranging from basic to advanced image processing and narrowband techniques. Interested in science? Learn photometry and how that can be applied to research applications like Exoplanets, Binary/Variable stars, etc.